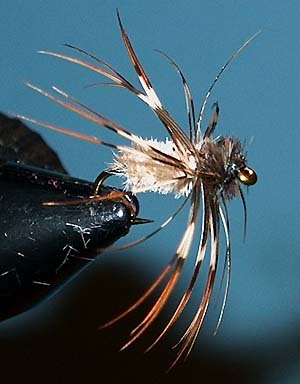 This is a soft hackle wet fly which imitates a caddis pupa. It has taken a number of 20"+ rainbows out of the lower Sacramento River for me and my friends. It's also been effective at Hat Creek. Head: Ostrich Herl Brush, Black or Dark Gray. Start the thread and take it 1/4 the way down the shank. Strip the fluff off the base of the hackle feather and most of the barbs off the left side as you face the concave side, and tie it in, concave side up. The feather will be wound to this side--clockwise as you face the eye. 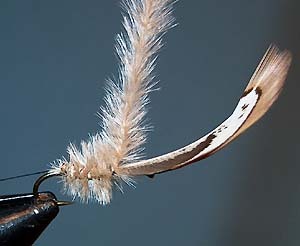 Just behind the feather, tie on at its midpoint an 8" piece of about 0.006" copper wire (the diameter of 5x tippet). 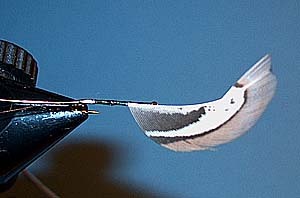 Balance up the ends and wrap the two strands down to about opposite the barb of the hook. Tie in three or four ostrich herls opposite the barb, taking the thread back to just behind the hackle. Grab the two strands of wire and the herls down at their ends with hackle pliers. With some kind of hook device, made say from a paper clip, spin the pliers and form the brush. Don't twist so much that you break the brush. You will probably get more twist in the lower end than the upper. Move the pliers up to about an inch from the tie-in and twist to correct this. In making these herl brushes, use fairly light wire unless you want to add a lot of weight to the fly, which is not a good idea with soft hackles. They can be made either in place on the hook or offline beforehand. With long enough herls, one brush will suffice for three or four flies. For the head brush, I try to use short barbed herls and only two at a time and the lightest wire I can find. This is about #40 A.W.G. (American Wire Gauge) which just under 0.004" diameter or 0.1 mm. I got some by salvaging an old relay. Wind the brush around the shank to just behind the hackle, tie it off and cut off the rest of the brush. There should be enough brush left to tie two or three more flies. The barbs of most ostrich herls are a bit long, so I cut them back giving the body a buzz cut look here. 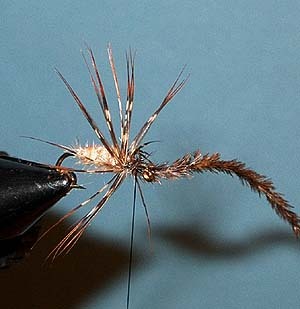 Wind the hackle from front to back, two to three wraps at most, tie down and trim. Take the thread forward, wrapping through the hackle wraps to reinforce them. Just in front of the hackle tie in the dark herl brush for the head. This you can construct right here in place, just like the body brush, or beforehand offline. Take the thread to the eye, wrap the brush to the eye, tie it off and whip finish.